I was browsing through some Beano comics from the late 1990's when I came across this advertisement for Jaffa Cakes by Gordon Bell. Ten years earlier, Gordon was illustrating Nipper for the comic of the same name. Now, I don't know if it's just me but the character in the strip above looks awfully similar to Nipper, and he seems to have aged correctly too. Here's a picture of Nipper for you to compare. 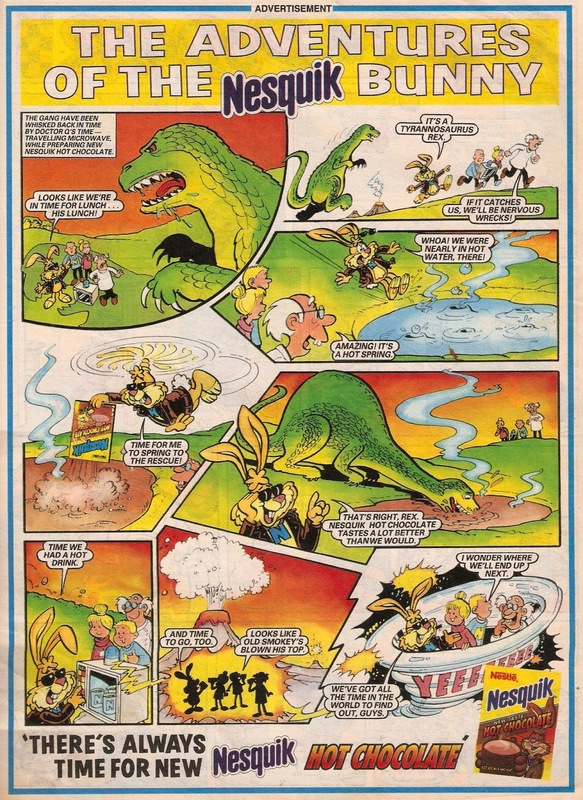 There were some well-drawn adverts in the Beano back then. 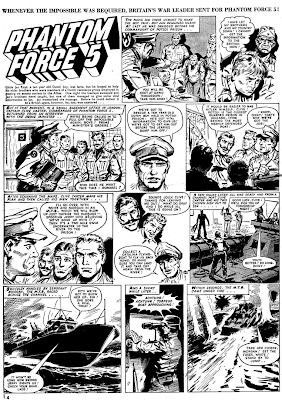 I might show some others another time, but just in case I never get round to it here's another one from a few months earlier, also drawn by Gordon Bell. A Year A Day - With The Beano! 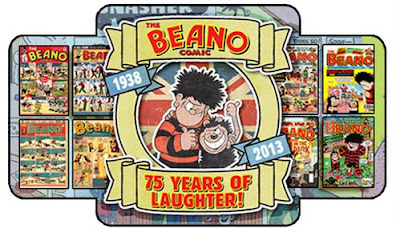 The Beano are celebrating a countdown of every year since 1938 up to the present day by showing you what happened in a particular year. 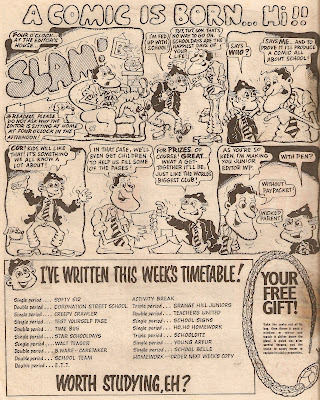 So far you can see the first ever Beano, the first ever Beano book, strips from the Second World War and more, with a new year added every day! 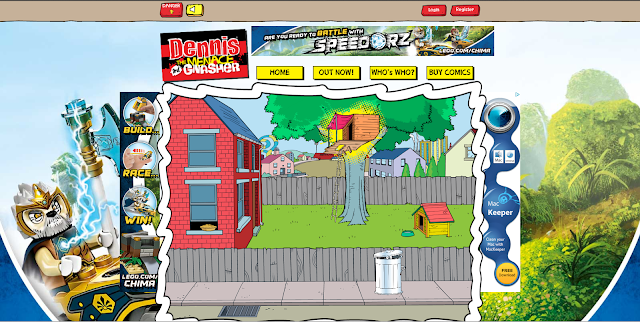 Dennis and Gnasher Get Their Own Website! The home page. The big image of Dennis' garden is interactive. Since getting their own comic by taking over the BeanoMax Dennis and Gnasher have now taken over the internet. 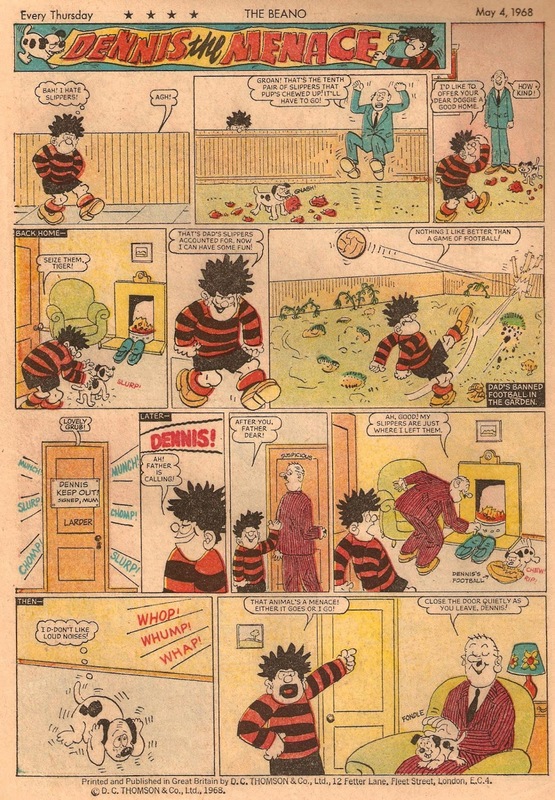 Like the Beano website this one has a preview of the latest issue of the Dennis the Menace and Gnasher Megazine. I've embedded it below, but if it doesn't work (be patient, it can take 30 seconds or so to load), just click the "Out Now" button on the website. My apologies for being a bit quiet lately, I've been doing a lot of writing and drawing this week (amongst other things), but more about that soon. 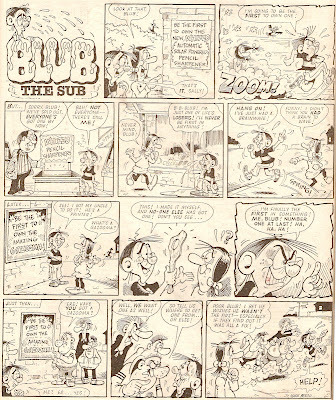 Today though, I bring you a treat, as here we have a crossover between Faceache and Blub The Sub, as illustrated by the one and only Ken Reid. 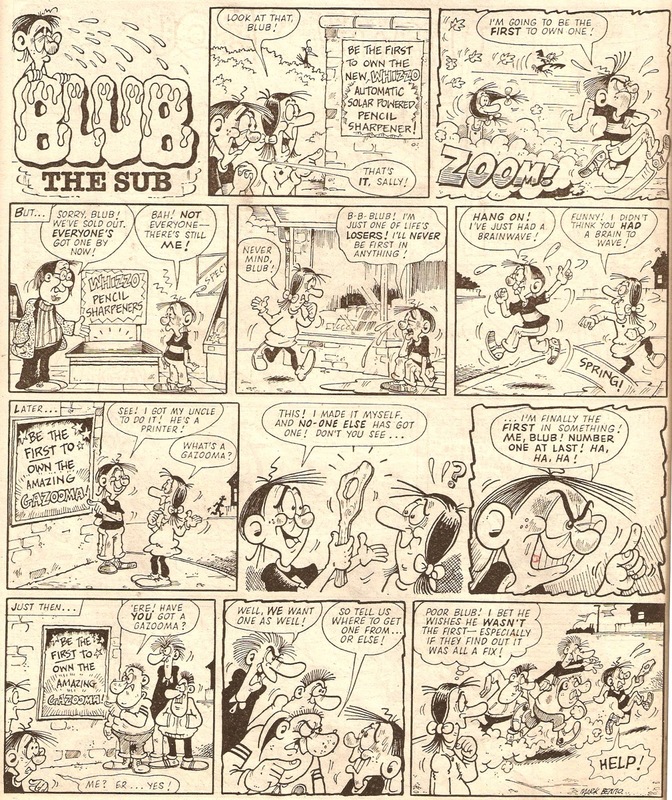 Both of these characters appeared in Buster with Faceache drawn by Reid (and occasionally Frank McDiarmid) and Blub by Mark Bennington. 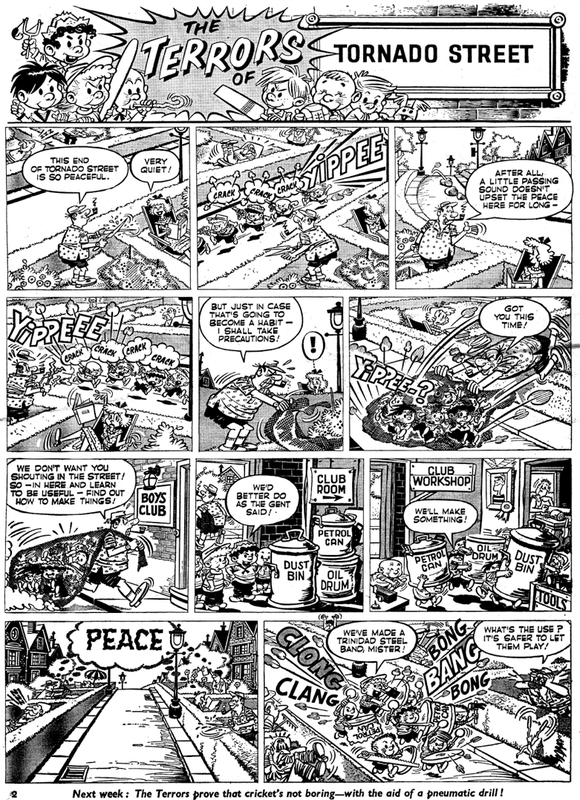 As always, click on the image to enlarge, and then again to view in full size! Blub was always upset because he was never first in anything. He was the fifth substitute in the school's football team and would often try to get the other four subs in hospital or out of the way, just so he could play a game. It wasn't just football he wasn't first in though, as this strip proves. 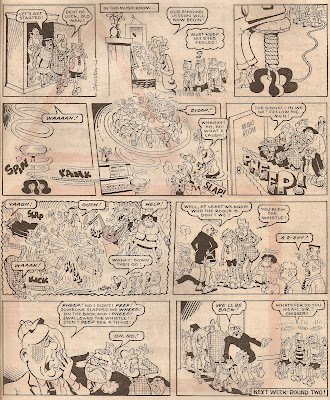 This Faceache strip can be found in Buster dated 13th December 1986, and here's the cover, sporting an illustration by Tom Paterson (what a line-up of artists Buster had, eh!). 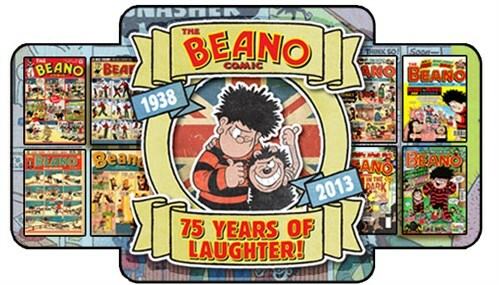 Today is the day that the Beano's 75th birthday special goes on sale! It's a great achievement, and The Beano is one of the longest running comics in the world, and is the comic with the most issues, with the latest being numbered at a whopping #3695! 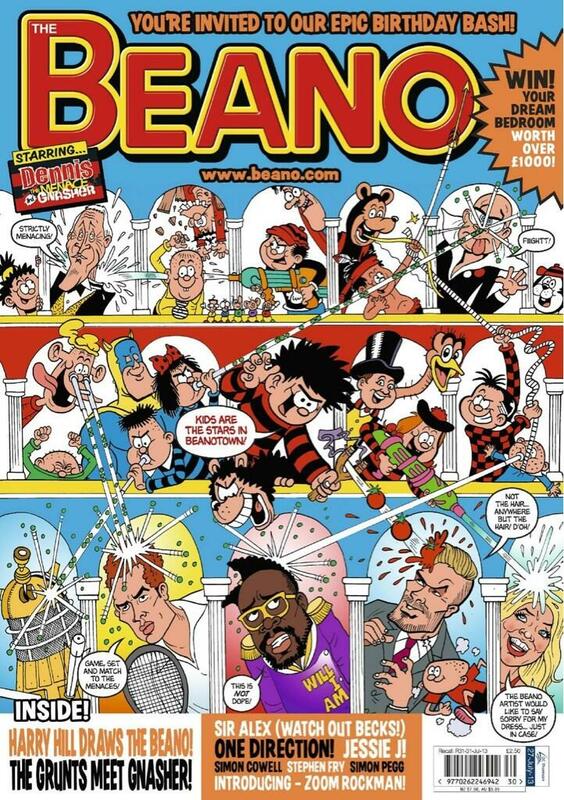 It's certainly amazing how long it's lasted, how much it's changed and how famous it's become - if you ask just about anybody in the UK what comics they know or read almost everybody will reply with "The Beano"! 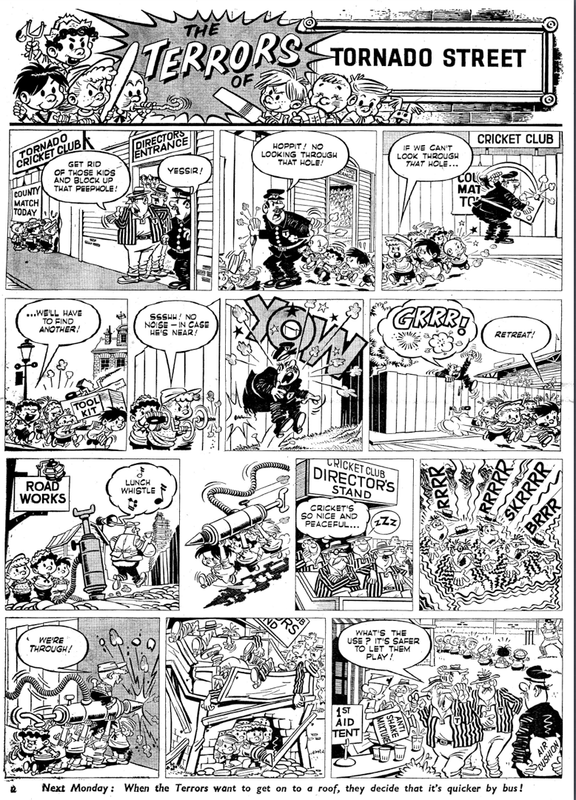 Such an achievement deserves celebration, so here are a couple of my favourite strips ever to appear in The Beano! 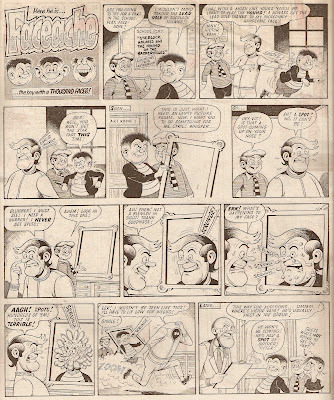 These two pages were remarkably easy to find - being my favourite strips meant I could, much to my surprise, remember exactly which comics they appeared in. You can buy the 75th issue today, for only £2.50. 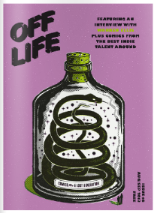 It' not an issue to be missed, so go and get one now! 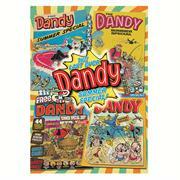 Dandy Summer Special Returns - And A Few Other Bits N' Bobs! 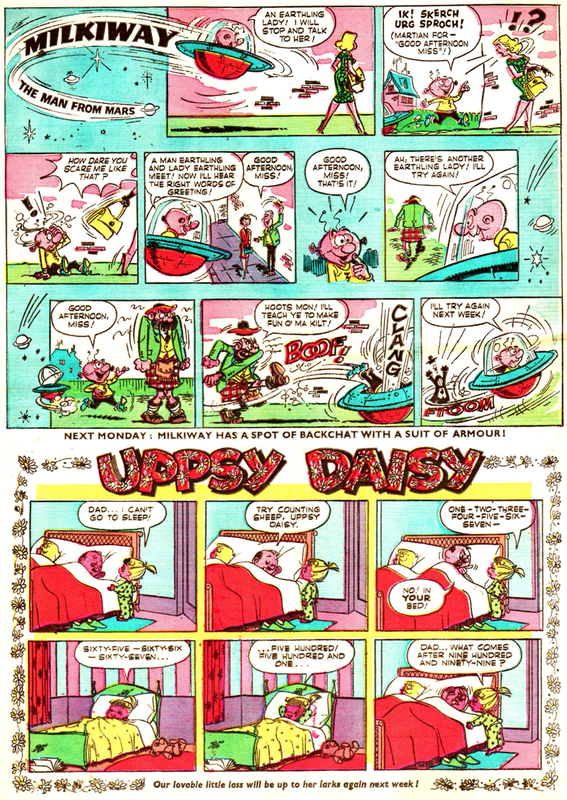 Yes, the Dandy summer special has returned for one last time. It goes on sale on Monday July 22nd and costs £4.99 from D.C Thomson's online shop, and that price includes postage to the U.K. 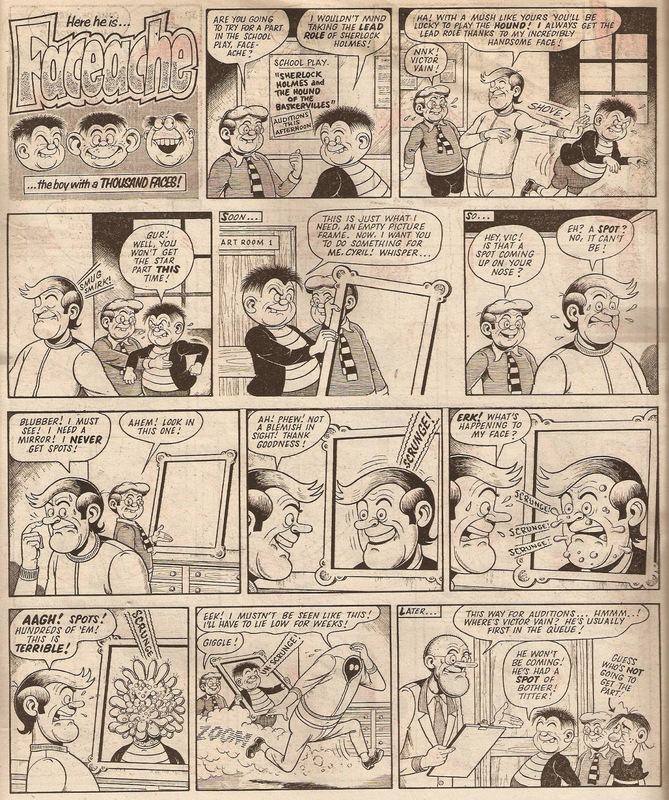 The comics' full title is The Last Ever Dandy Summer Special, and I can't help but think if they're saying that so they get the same result as they did with the last ever Dandy back in December. Unfortunately there doesn't seem to be any larger images of the Dandy's cover so the image on the right will be the best one until I get a copy! There didn't seem to be much news surrounding the upcoming birthday edition of The Beano, but suddenly we heard loads! First of all Barry Appleby, Dave Eastbury and Barry Glennard will sadly be leaving, and Jamie Smart will take over on Roger the Dodger. 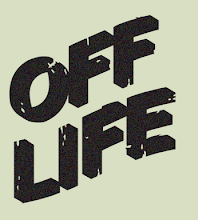 The Numskulls are back and will be taking a look at the insides of celebrity's heads, Ball Boy gets a new look and there are lots of strips about celebrities. 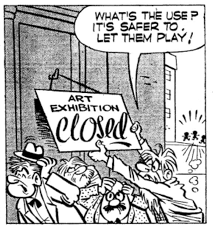 I hope the celebrities are only there for one issue, and it's a shame to hear all those great artists are leaving. All in all, it doesn't sound like much of a celebration and it sounds like there are too many celebrities, but I can't judge until I get a copy. As for the cover, the only thing I've seen is the Beano 75th Birthday Bookazine which is on the right, and I'm not sure if this is the ordinary weekly Beano or a bonus celebration book. 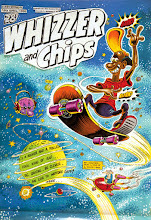 Whatever it is it's available from the D.C Thomson shop for £6.99 - which seems a bit expensive for the weekly comic so I'm guessing it's a seperate publication. One or two details have been revealed about the Dennis and Gnasher Megazine, which is due for release on the 24th July (this Wednesday). 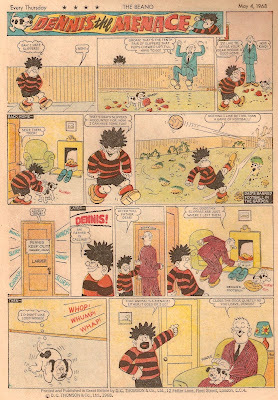 First up, each issue will feature a Dennis the Menace story that will be split up into three parts throughout the comic, written by Nigel Aucherlounie and drawn by Nigel Parkinson (the same team who produce Dennis in the weekly). 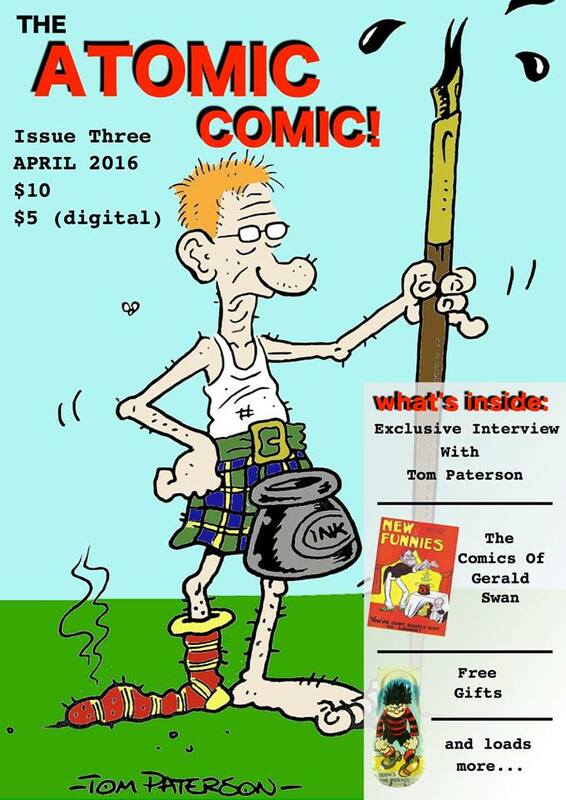 Dennis' comic stash is just reprints, as expected, and the first issue has reprints of Nuke Noodle from the Dandy. It won't be Nuke Noodle every month as there aren't enough strips to fill up 32 pages every issue, and I expect that there will be many reprints from the 2010 - 2012 Dandy. Each issue also come bagged with around four gifts. Subscriptions to the Dennis and Gnasher Megazine are available from the D.C Thomson shop, and the cheapest option is £1 for the first three months and £10 per quarter from then on (for U.K delivery). All this happens over the next three days - so it should be an exciting week! 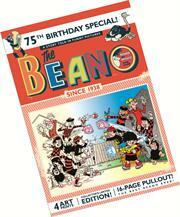 The Beano cover you see above for the Beano Bookazine is indeed a seperate publication to the 75th Birthday edition. Here's the actual cover, out on Wednesday for £2.50 - just 50p more than usual! Back in 1983 - School Fun Is Launched! An attractive cover by Bob Nixon. 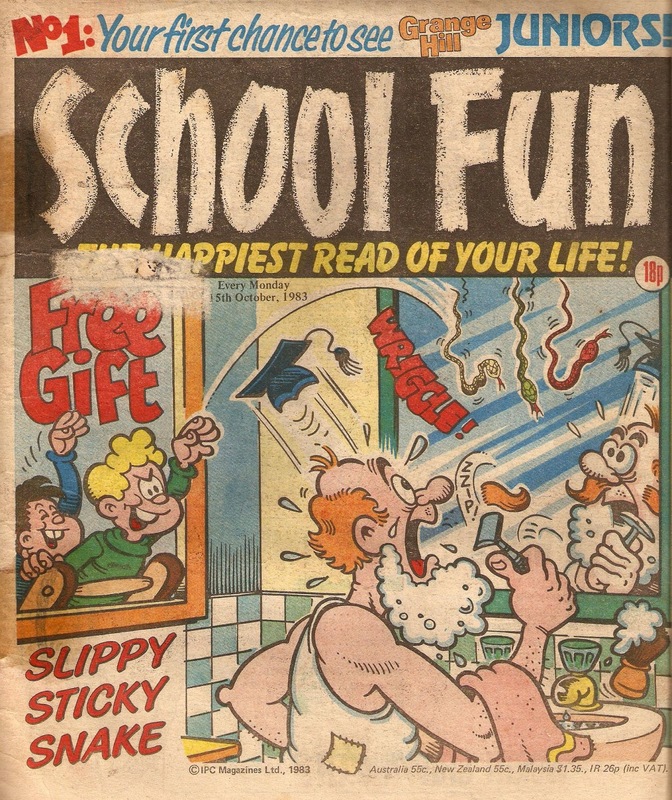 School Fun was a new title launched by IPC in 1983, with the first issue dated 15th October (although probably came out a week earlier on the 8th). 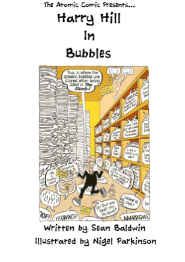 As the title suggests, it has strips that are based around a school theme. 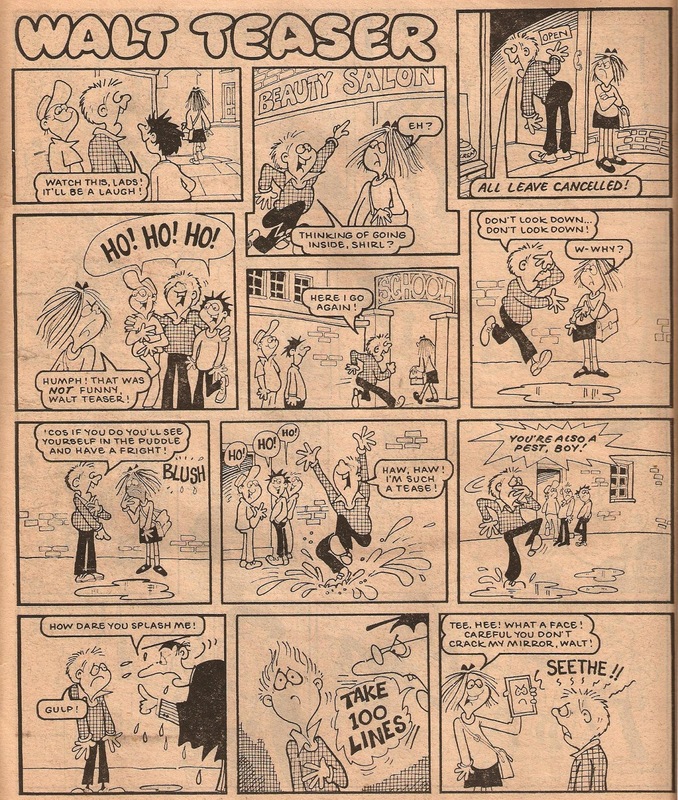 I'd imagine school is a very popular theme as all kids have to go there and can relate, which probably led to the Bash Street Kids' success, but perhaps a whole school-themed comic is going a bit far as it's not the most fun place in the world, but I'll leave that for you to decide once you've seen the contents. The first issue cost 18p and came presented with a free gift of a 'Slippy Sticky Snake' sellotaped to the cover, which was a small rubber snake available in various colours (I've seen red, yellow, blue and green, and there were probably others). 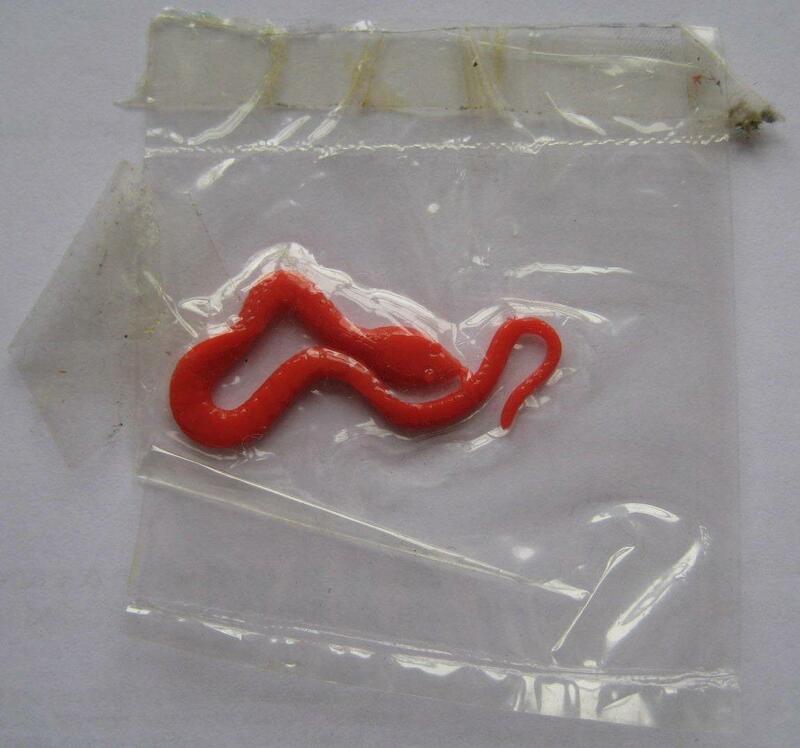 The snake is designed to be thrown at a mirror or window and it will then slither down, as shown on the front cover. 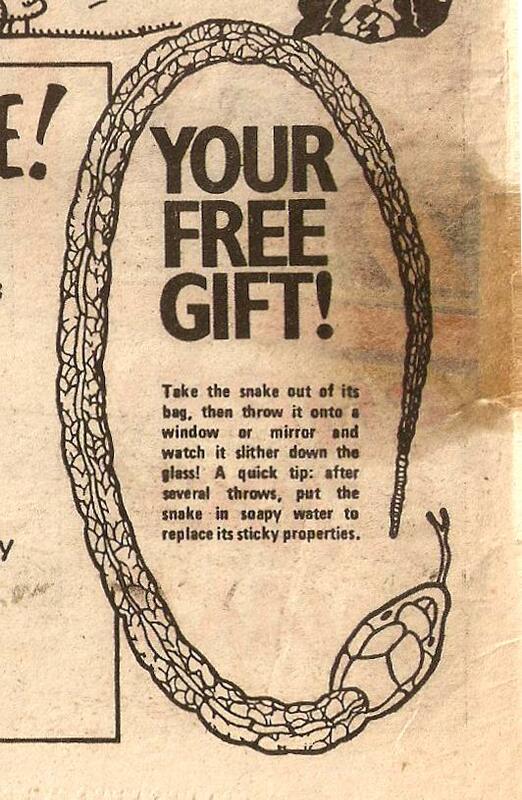 Although this is explained inside, I'm sure it could be used for other pranks too. A fun toy, and I can bet many of them were lost well before issue two arrived in the stores! 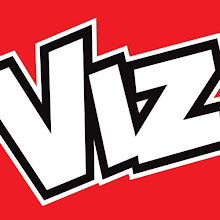 The first strip inside is called 'A Comic Is Born... Hi!!' and shows how the comic came into existence. I really like the way they've designed the contents panel in the form of a timetable, with comic strips lasting single, double or triple periods depending on how many pages they have, as well as the "homework", which is to order next week's copy. 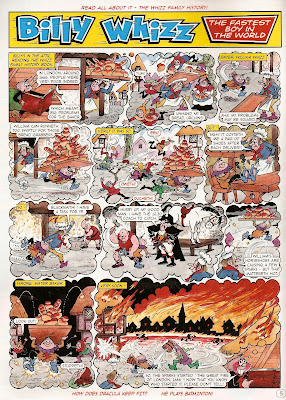 The first proper comic strip comes from the hand of the longest running Minnie the Minx artist Jim Petrie. 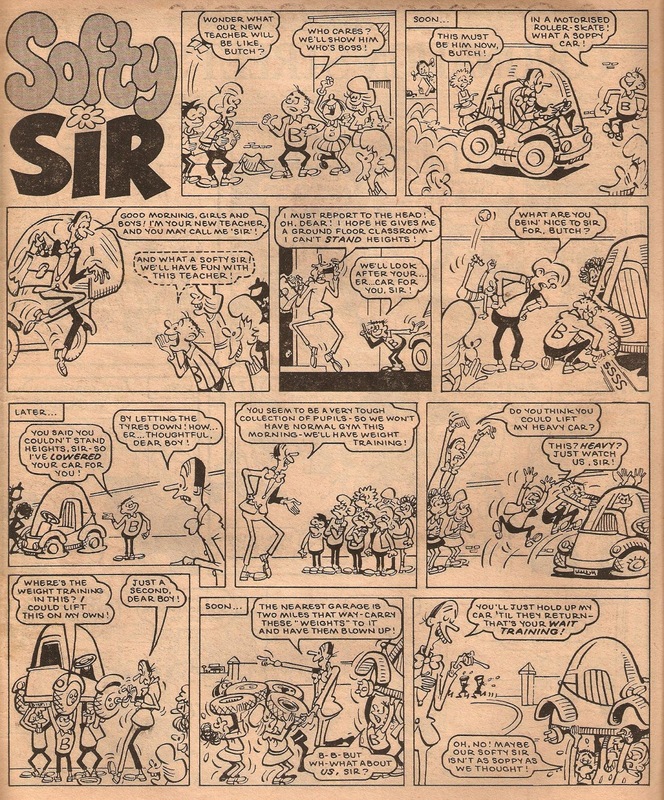 Softy Sir is a strip about a teacher who is, well... a softy - it says it all in the name really! 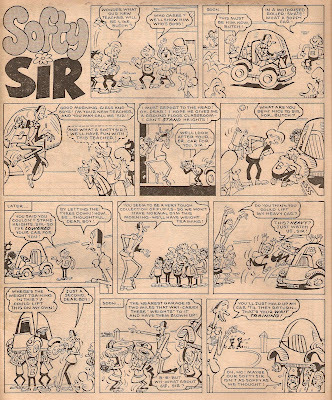 As always Jim has done a wonderful job of illustrating the strip and all in all Sir is a very funny character, with this first episode ending in a pun. 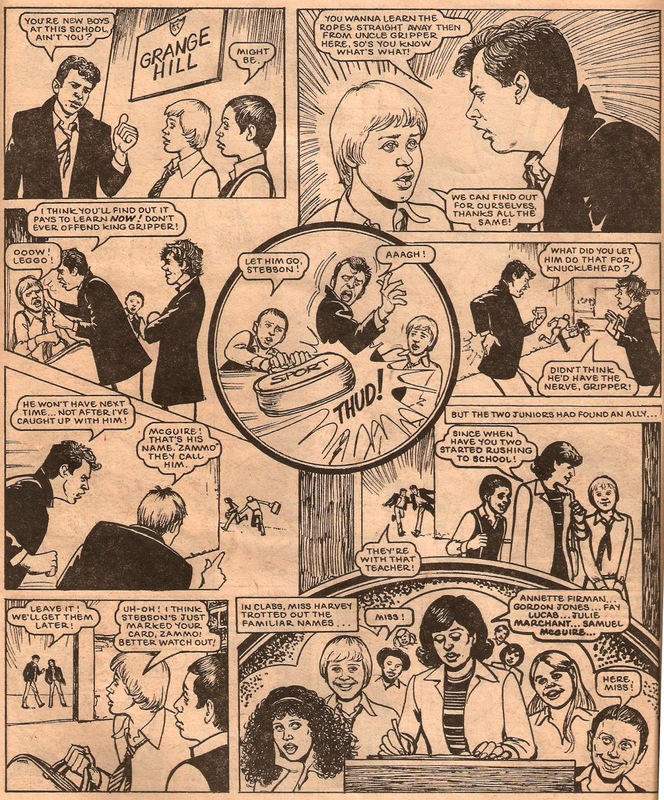 The next strip is an interesting one - Coronation Street School. Illustrated by Colin Whittock, it's not hard to guess which television program this is based on. It's well drawn and surprisingly well written so is a good strip. Had this strip lasted longer I'm sure it would have become more popular than it was, but it didn't survive School Fun's merge into Buster. Still, it's a funny and entertaining read and deserved the two pages it had. One of the most memorable characters from School Fun is Walt Teaser. After School Fun ended Walt would survive the merge into Buster where he would continue for several years before the strip ended in 1987. The idea behind Walt Teaser is very simple, an ordinary kid who goes around mocking people, only for his jokes to backfire on him. 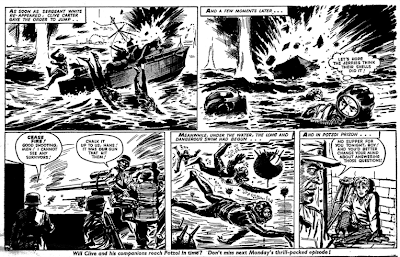 It was a good strip and was illustrated by Anthony Hutchings, although this is the early days of Anthony's art and his style isn't as smooth or accomplished as it was going to become. The centre spread was given to E.T.T, which stood for Extra Terrestrial Teacher. 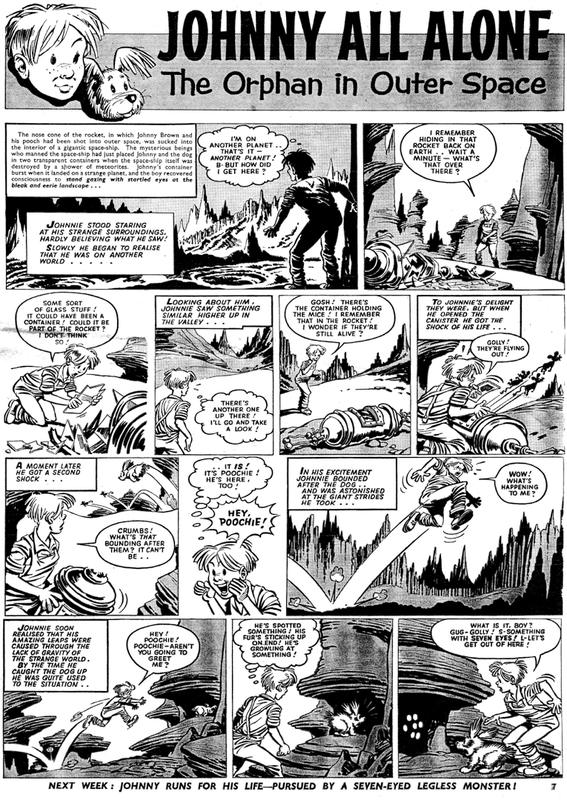 The strip was about a teacher from the planet Freeky who was accidentally left behind on Earth, and was illustrated by David Mostyn. 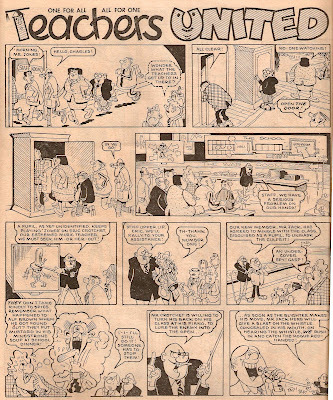 Coronation Street School wasn't the only comic strip in School Fun to be based on a television show. 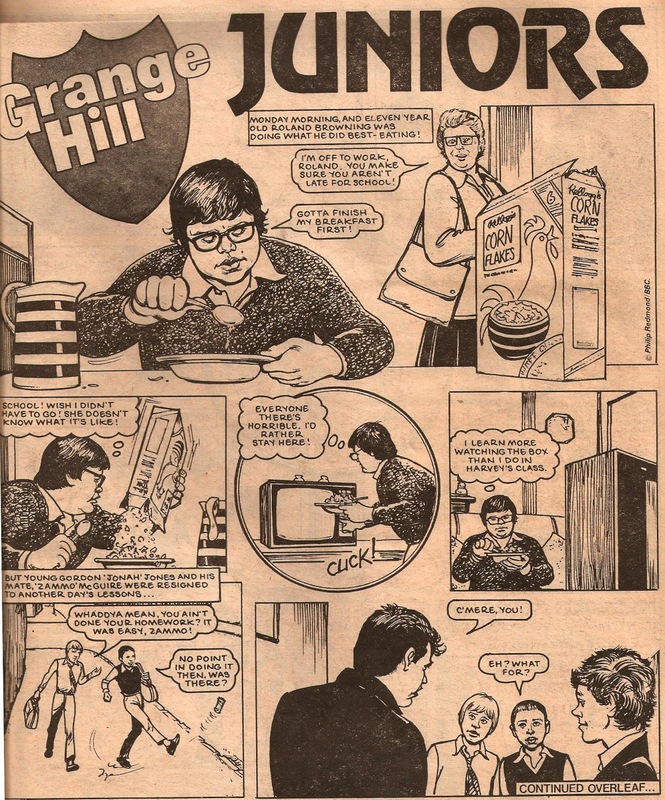 Grange Hill Juniors is the next strip, and was of course based on the T.V. show Grange Hill. I don't think the strip is as good as Coronation Street School but it was still given three pages, and was illustrated by Brian Delaney. 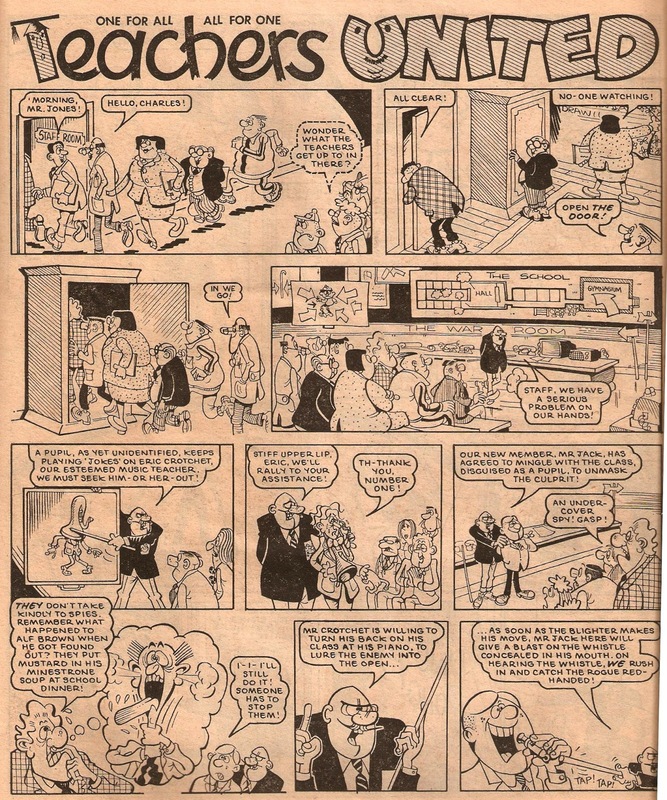 A very popular and always funny strip was Teachers United. 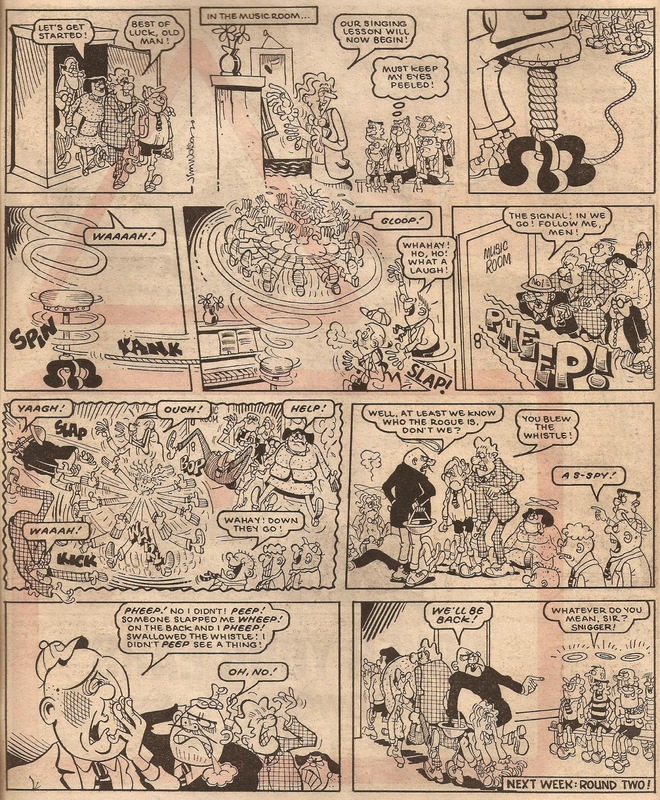 Illustrated by Jim Watson, the strip followed a group of teachers who teamed together in the school's top secret war room to bring down pranksters and tricksters or win competitions or whatever obstacle they had to overcome. 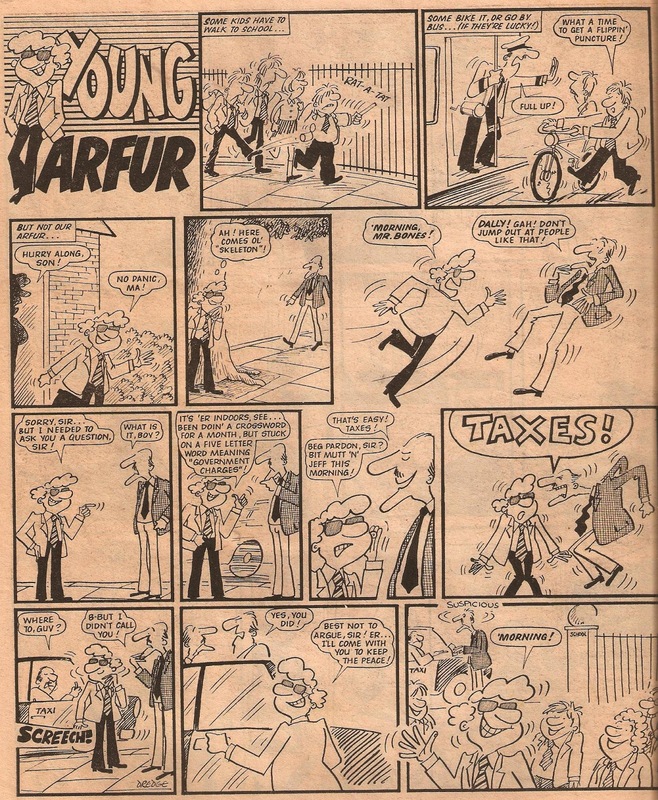 The final strip I'll be showing if Young Arfur. 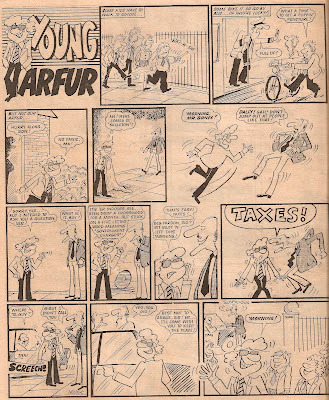 Arfur was a sort of Roger the Dodger - he'd do anything to get out of hard work! 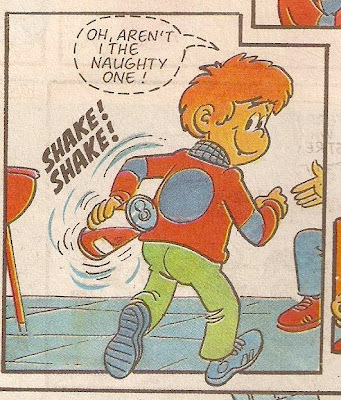 In this first episode he tries to get out of walking to school, at the expense of his poor old teacher Mr. Bones. 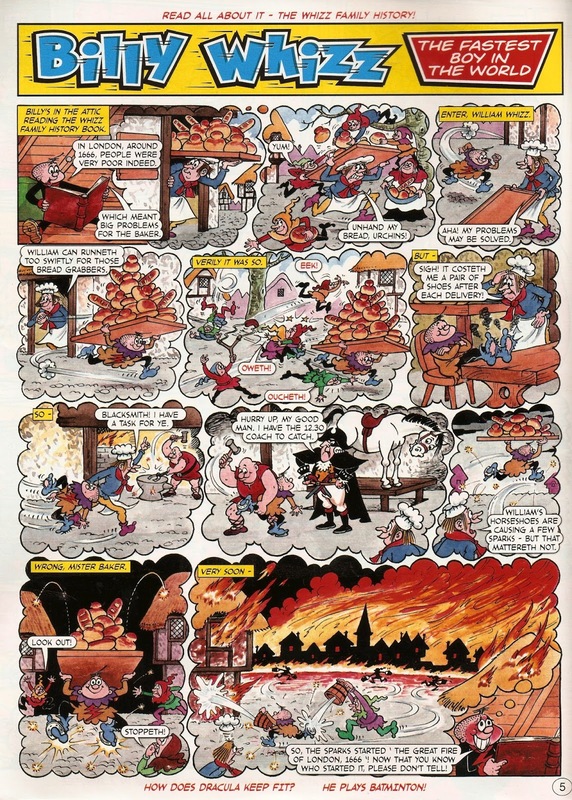 The strip is illustrated by Pete Dredge. 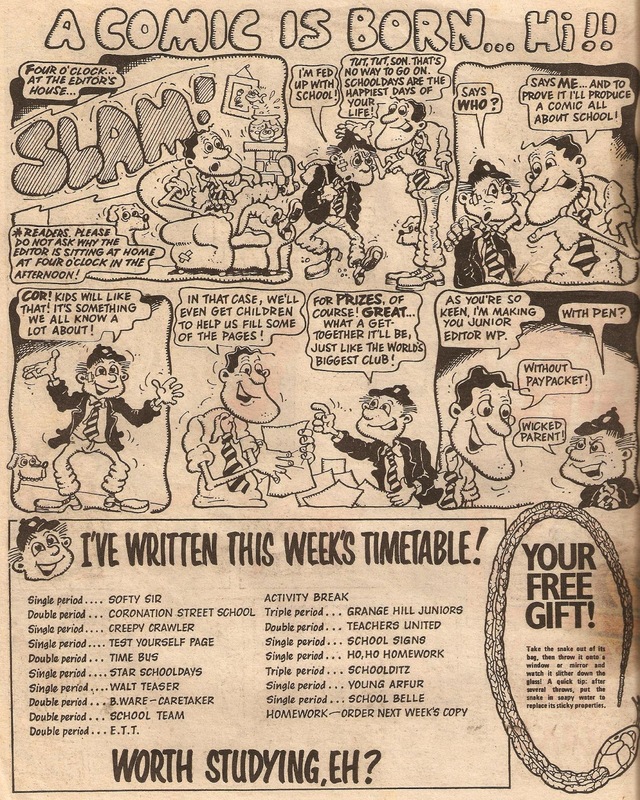 Sadly, School Fun didn't last long on the market and after just 33 issues it folded and merged into the popular Buster, with the last issue dated 26th May 1984. However, despite it's short run quite a few memorable characters came from it. Characters such as School Belle, Walt Teaser, B. Ware and others, all of which would go on to have lengthy runs in Buster. 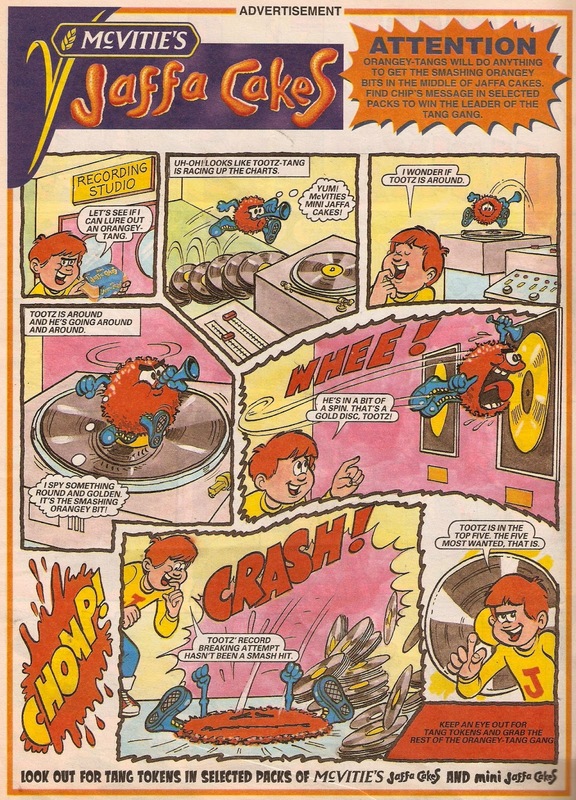 School Fun is considered by many to be Fleetway's last attempt at a new fun comic. Yes, they launched Oink in 1986 and Nipper in 1987 but both of these were aimed at different audiences, with Nipper aimed at a younger audience and Oink at an older one. 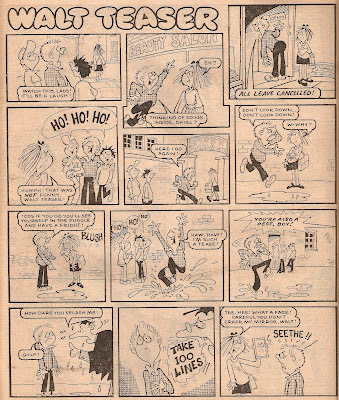 School Fun was their very last traditional humour comic, and it's a shame it has very nearly being forgotten. The very first combined Buster and School Fun. 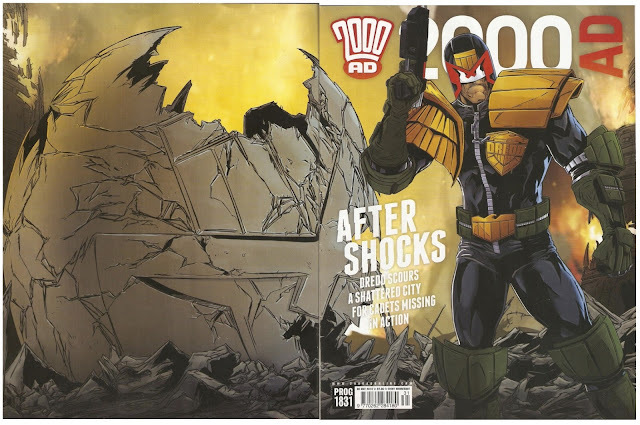 The other day I bought my first new copy of 2000AD. I've grabbed myself one or two old issues in the past, but this was the first time I'd bought a new copy. It is #1831, and went on sale in the UK way back in May, but is only just being replaced by #1832 today here in New Zealand. Firstly: the positives. There are five strips spread out over 32 pages, and each one of them proved to be an engaging read and the comic is thoroughly enjoyable. Plus, with Ben Willsher's excellent wrap-around cover the comic really did stand out on the shelves. But this is where the negative kicks in. For a new and/or one off reader such as myself, there isn't one complete story in the comic. 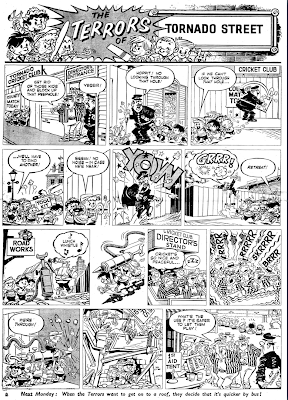 Now I understand that having continued strips helps keep readers coming back, but for somebody who just wants one issue there isn't a complete comic strip to enjoy. In this issue the closest we've got to the start of a comic strip is part two of Judge Dredd and part two of Gunheadz, and when reading these and other strips I really had no idea what was going on. 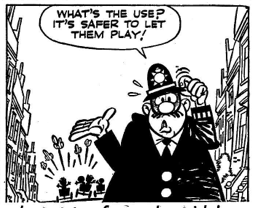 For example, in Dandrige - The Copper Conspiracy the strip starts with a man fighting a copper cop on the roof of a bus, which is being driven by a headless driver! 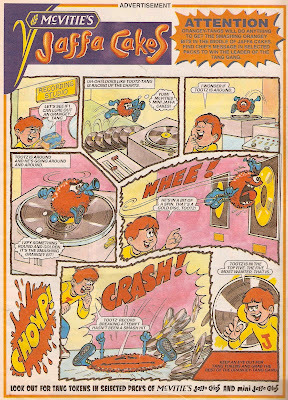 Whereas all the strips are a good read and the comic is well made it would be nice to have one or two complete strips every issue. Still, it's a good read and at £2.35 an issue the price isn't too bad either. And it's not like 2000AD sells poorly, so they can't be doing too much wrong! 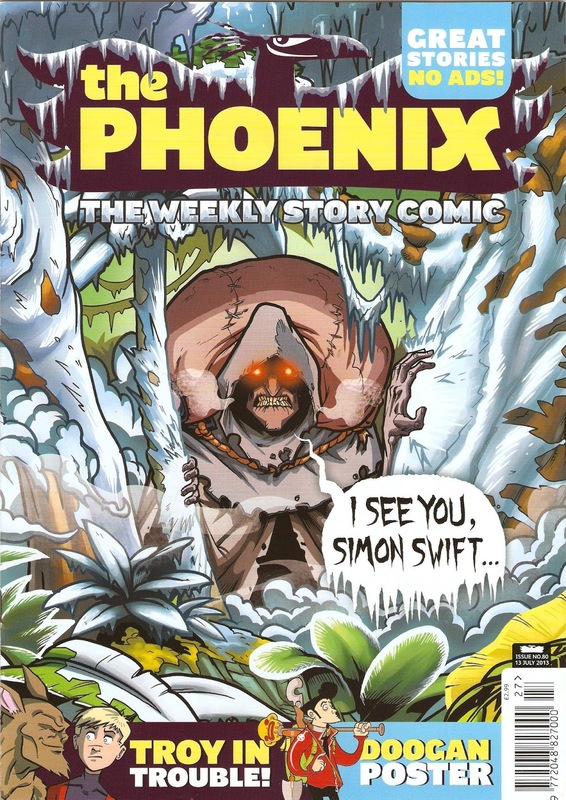 The Phoenix has really improved lately, and each issue is getting better and better, and I personally find the latest issue the best one... ever! Every page is a joy to behold, from the thrilling edge-of-your-seat Pirates of Pangaea cliffhanger to the gross humour of Bunny Vs. Monkey there's something in the comic for everybody. The centre spread of the latest issue (#80) displays a fantastic Von Doogan poster by Lorenzo Etherington, Mike Cavallaro illustrates a fantastic and funny four page Nico Bravo strip and James Turner concludes the latest Star Cat serial. If you haven't read the Phoenix in a while or have never read an issue now is a brilliant time to start, as the comic is currently at its prime! Each issue costs £2.99 and a new issue comes out every Saturday, but you'd better get to the stores early because they sell out fast! Alternatively, if you're not a morning person why not subscribe and get each issue delivered straight to your door! Subscriptions start from one month (four issues) at just £8.99 and you used to be able to get a one year subscription for £99, but I can't see that on their website. Plus - if you subscribe you're paying less than you would do in the stores! You can also buy back issues, right back to issue #1! All this is available from the shop on their website. 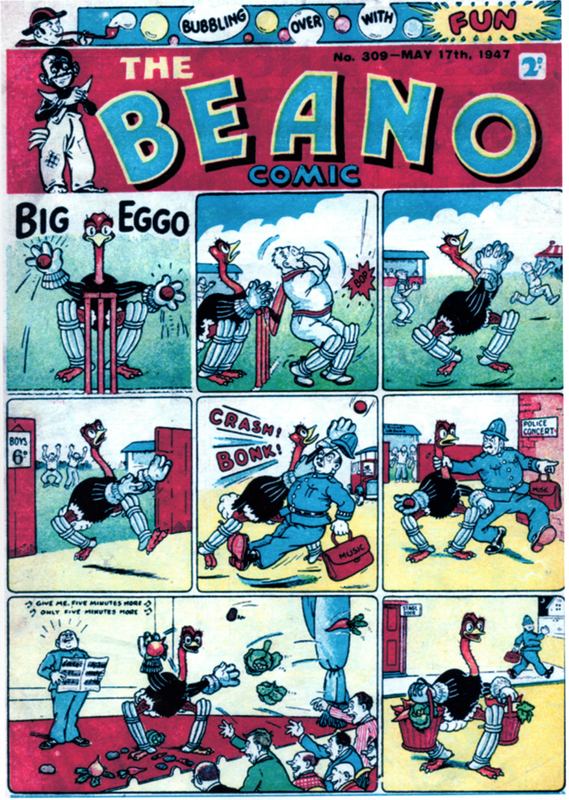 To tie in with The Ashes I thought it'd be fun to post a few comic strips with a cricket theme. We start off by heading all the way back to the Beano of 1947, where Big Eggo gives the sport a go, only to end up in a theatre with a policeman! How did he do it? Click on the image below to find out! Art by Reg Carter. 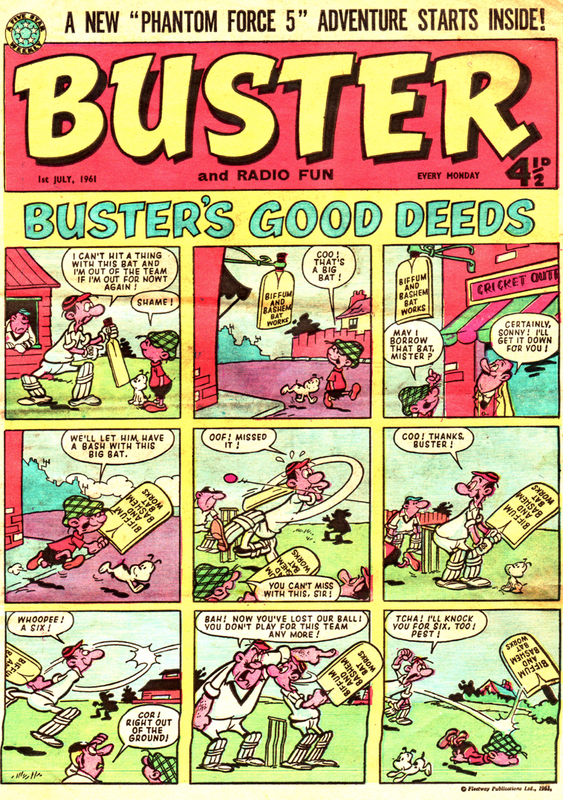 Coming forwards 14 years to a 1961 issue of Buster. This time Buster tries to help a cricketer, but does too good a job! Hugh McNeill is the artist here. 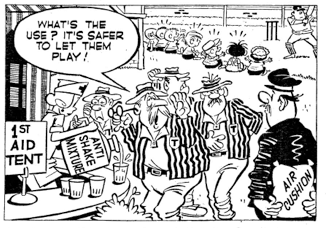 Come forwards to 1970 now to an early issue of Cor, and in this one the Robot Maker helps out a struggling cricket team in order to win the match. But there's a lot at stake, because if they don't win the club will have to fold due to lack of funds! Frank McDiarmid did a wonderful job illustrating this strip, and this episode is no exception. And in the 1971 Cor summer special the Hire A Horror team helps a man watch the test match in peace! I'm not sure who the artist is, but it's definitely not the usual Reg Parlett. And finally, we head back to 1960 and take a look at this Terrors Of Tornado Street strip by Juan Rafart. This Week In... 1960 - Buster! 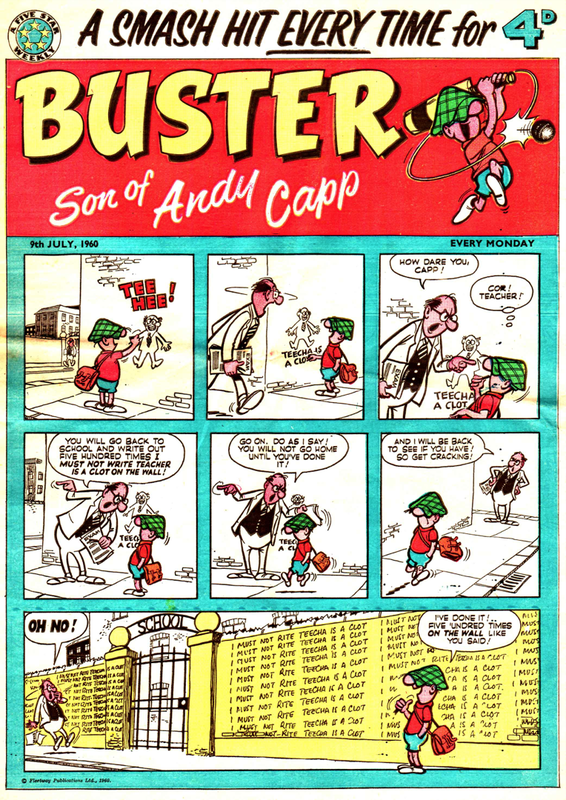 I haven't written a 'This Week In' post for almost two months so it's about time I did, and this time we head back to the very early days of Buster, and look at the issue that went on sale this week in 1960! Buster had only begun in May 1960, making this issue #7. 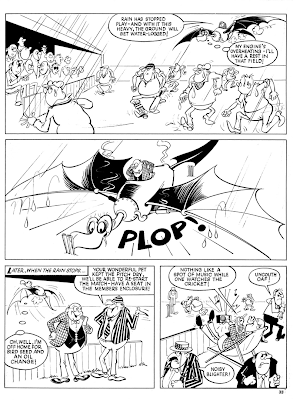 Here Buster is drawn by Bill Titcombe, who wouldn't draw the strip for long, not even lasting one full year! 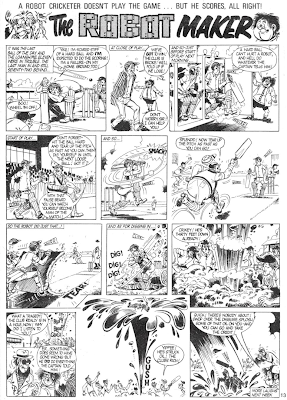 The strip over the page is The Terrors Of Tornado Street drawn by Juan Rafart. 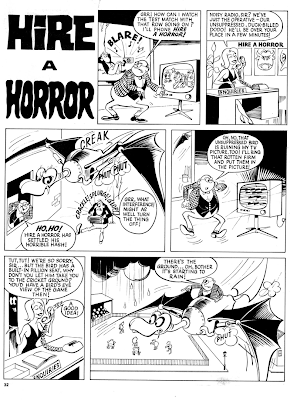 Each week the terrors' strip would end with a character always saying the same line - "What's the use? It's safer to let them play!" Each week it would be the character that had tried to spoil the kids fun, only for their plans to backfire! Here are a few examples. 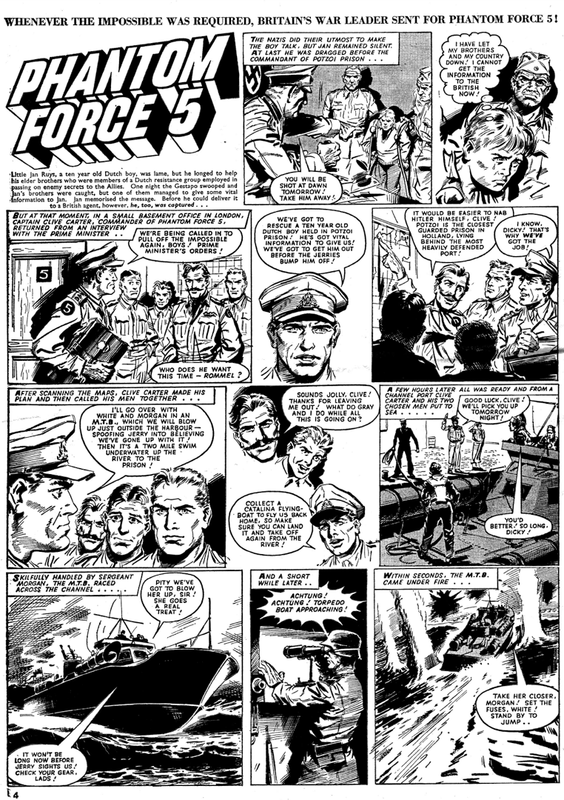 Buster had its fair share of adventure strips, but the most popular had to be Phantom Force 5. 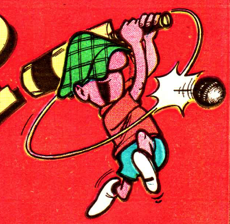 Eric Bradbury drew the first series, and the strip was later reprinted in Smash under the name of 'Send for Q Squad' at the end of the decade. 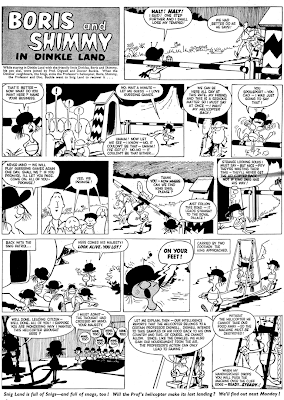 The weirdest strip in the comic is probably Boris and Shimmy in Dinkle Land. 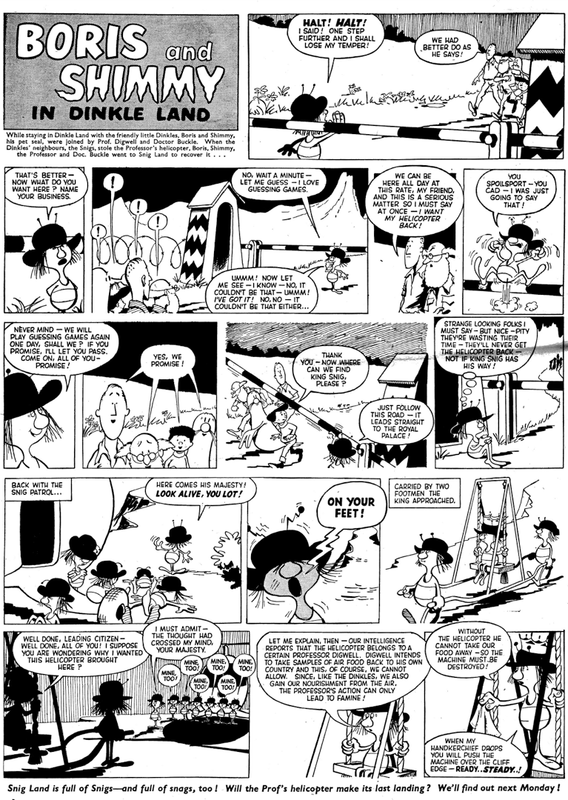 I don't have the first issue of Buster but Peter Gray did post the first episode on his website, and it turns out they simply walked into Dinkle Land when they got lost. Weird, and here's the strip for your amusement, and the artist is David Myers. You can read the first two episodes on Peter Gray's site by clicking the link below! Another strange strip is Johnny All Alone - The Orphan In Outer Space. This strip is about Johnny and his dog Poochie who were fired into space after stowing away in a rocket's nose cone - a bit far fetched but still a good story. I might show how he came to be on the rocket sometime in the future. I'm not sure who the artist was, at first I thought it was Tom Kerr but I'm probably wrong. Can anybody identify him/her? The centre spread is the home of one of my favourite early characters from Buster - Milkiway. Milkiway is a good-hearted alien who tries to help people here on Earth, but doesn't quite understand what is going on and often becomes a nuisance. 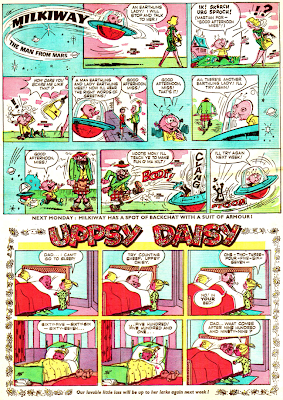 He shared his page with Uppsy Daisy, and I think Angel Nadal Quirch drew both strips. 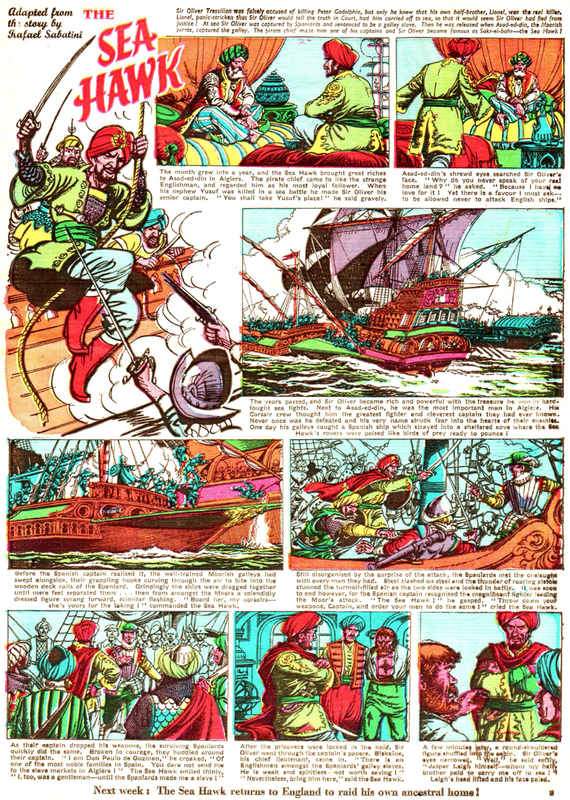 Also on the centre spread was The Sea Hawk, and was drawn by Eric Parker and Pat Nicolle. 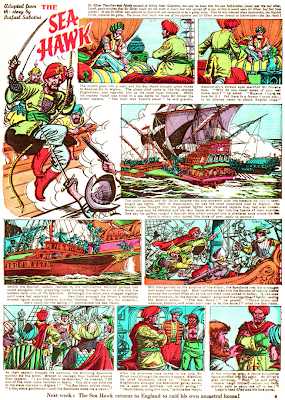 This strip was based on the 1915 novel of the same name, written by Raphael Sabatini. 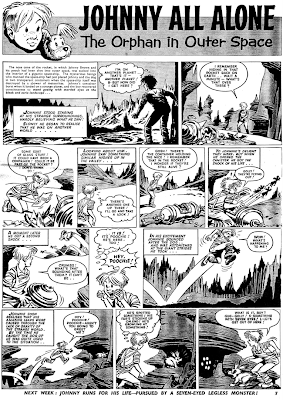 Basing a comic strip directly on a novel is an interesting idea, and I wonder if it was popular - I suppose fans of the book would have loved it! 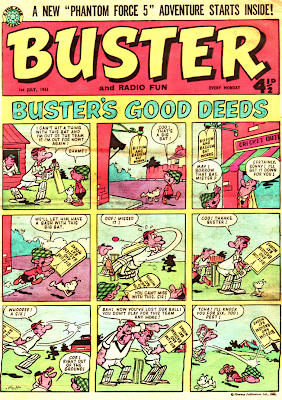 These early Buster comics were tabloid in order to stand out from the rest of the comics available, and also had brilliant bright red covers! 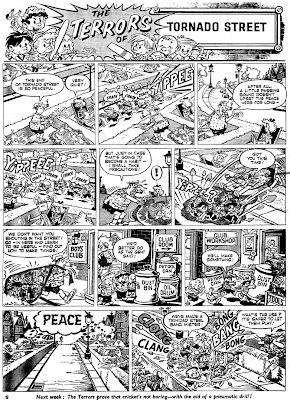 The size wouldn't last for long though, and here's a look at this Buster comic next to one from each of the following decades. Where will the comics time machine take us next? I don't know - we'll have to wait and see!